For most of human history, we effortlessly consumed (nose-to-tail) the things we needed for strength, health and happiness. Like the fertile ground that we once walked upon, we were a natural extension of this earth. In the modern world, we unknowingly struggle to fulfill our nutritional needs in order to support and sustain a vibrant, disease-free life. We are now part of a world where biliary tract (liver, gallbladder and bile ducts) gut and digestive conditions are ubiquitous. The solution is to address the root cause with dietary, lifestyle and behavioral choices while nourishing and supporting our biliary tract with proven anthropological ways that are backed by modern science... this includes the use of desiccated gallbladder, ox bile and liver. Our early Native American ancestors would commonly take a buffalo, cut it open on the spot, and eat the warm liver seasoned with gallbladder and bile. The bile was sprinkled on various organs and glands as a condiment... the way we might use mustard today.2 Word has it that gallbladder and bile did a lot for the taste of liver. It likely did a whole lot more than just improve the taste. For thousands of years, the Chinese have considered the bile salts a "cold" medicine, believed to extinguish the "heat" of an illness like digestive conditions, diabetes and even high blood pressure. It is especially valued as a treatment for serious liver disease.3 The active substance in bile (of bear and all other mammals, including cows) is ursodeoxycholic acid (UDCA). SUGGESTED USE: Two capsules per meal or as directed by a healthcare professional. Traditional peoples, Native Americans and early ancestral healers believed that eating the organs from a healthy animal would strengthen and support the health of the corresponding organ of the individual. For instance, the traditional way of treating a person with a weak heart was to feed the person the heart of a healthy animal. Similarly, eating the kidneys of a healthy animal was believed to nourish urinary ailments, boost vitality and support overall kidney health... Pancreas was fed to people with digestive and endocrine problems... spleen was fed to people with immune and blood deficiencies...1 gallbladder, ox bile and liver provided concentrated amounts of gallbladder-specific building blocks, bile and liver that support our biliary tract (gallbladder, liver, bile ducts) and are now absent from the modern diet. Organs and glandulars were a staple of our early ancestors' diets as the ultimate superfood, for good reason. It turns out, this nourishing tradition is backed by science... "Radioisotope labeling studies in animals have shown conclusively that, when eaten, organs and glands selectively travel to the corresponding organs and glands in high concentrations. This research, done at the University of Scotland in Edinburgh, lends credence to the ancient practice of eating animal organs to help ensure health in one’s corresponding organs..." - Dr. Ron Schmid, ND. *6 Our early ancestors knew this, which is why their traditional diets included the frequent and nourishing consumption of nose-to-tail nutrients. Our Grass Fed Gallbladder (w/ Ox Bile & Liver) is a whole food dietary supplement that provides 100% pure bovine gallbladder with ox bile and liver. The suggested use of this supplement is to take 2 capsules per meal (even though it technically is food) or as directed by a healthcare professional — for added support, the dose can be doubled. Most customers tolerate our supplements without incident; however, approximately 5 to 10% of customers (usually with an autoimmune condition) may experience a detoxification reaction with the introduction of liver. Detoxification reactions go by many different names including healing reactions, healing crises, cleansing reactions (or) Herxheimer reactions with hallmark symptoms of nausea, headache, lethargy, dizziness and other flu like symptoms. In this instance, detoxification reactions are generally an indication that detoxification pathways in the body are back online... cells suddenly have an opportunity to release an even greater than normal quantity of stored toxins, metabolic wastes, pathogens and unwanted material. A detoxification reaction is more likely to occur when starting with the full suggested serving size of 2 capsules per meal. If you know that you are sensitive to supplements and/or you have an autoimmune condition, you may wish to start slow when adding this product to your current regimen. Tolerability can be greatly improved by starting with just 1 (or) 2 capsules a day and increasing by just 1 capsule every couple of days — this method may take a full two weeks to achieve the desired serving size of 2 capsules per meal (6 capsules) per day. For customers that are highly sensitive to supplements and/or have an autoimmune and/or methylation SNPs, I suggest that you "play it safe" by introducing just one new capsule per week. In other words, just 1 capsule during the 1st week... 2 capsules during the 2nd week... 3 capsules during the 3rd week and so on... yes, this will take some time to reach the suggested dosages but this greatly helps to ensure tolerability of this deep nourishment so that it has a chance to do good (all those gut health and digestion benefits). Eat Like Our Early Ancestors Did - Think root cause. Many people resolve gallbladder issues simply by eating a ketogenic / paleo / primalish diet... see example below. Remove Inflammatory Foods - Gluten's out... processed foods, and sugars are out... this can substantially improve gallbladder health and bile flow. Support Bile Flow - Biliary tract glandulars (like ours!) have a long history of supporting this system... bitters like curcumin, dandelion, milk thistle, and ginger are also well known for their ability to stimulate bile flow. Dissolve Gallstones - Use beet root, taurine, phosphatidylcholine, lemon, peppermint and vitamin C to reduce the impact of or even dissolve gallstones. Sleep Like Our Early Ancestors Did - On the hierarchy of health, sleep trumps almost everything else... see our "About Us" page for more on this. Move Like Our Early Ancestors Did - Start walking more... 20 - 30 minutes in the AM, 20 - 30 minutes after lunch, 20 - 30 minutes after diner. For serious gut, gallbladder, bile and digestive issues, a high fat, moderate protein, lowish-carb ketogenic / paleo / primal diet can be remarkably therapeutic (see below). Ketosis is a high healthy fat (75%), moderate protein (20%), low carbohydrate (5%) way of eating. Have a look at what my tribe and I eat... our first meal is downright delicious and our second meal is way better than any restaurant food. Organic raw pastured-raised milk (1 cup or 150g)... raw is best but Whole Kalona Brand Milk is a good second option if you don't do raw milk. If you don't tolerate milk, find an alternative. This shake takes me a whopping 15 minutes to make... It's super convenient... and, it's down right delicious. If I don't make a shake, I will have a bunch of pasture-raised eggs (8 or so) that are smothered in a massive amount of butter topped with crunchy sea salt, a side of avocado, nitrate-free, sugar-free bacon and a dollop of homemade sour cream. Are you kidding me... don't even try to tell me that your current breakfast is better in taste nor in health. We generally carb reload on the weekends with plenty of sweet potatoes, raw local honey, the occasional sorghum and various in-season fruits. For gut / digestive repair, I don't suggest massive refeeds like we do... stay the course until you're better, then you can do this. We also do a twenty-four to thirty hour fast on Sundays... it's not as bad as it sounds. We eat an early dinner as we normally would on early Saturday evening... skip our first meal on Sunday, and eat an amazing fish-based dinner (usually wild caught sardines with wild caught fish eggs) with the entire tribe on Sunday. Once a quarter, we do a 5-day water only fast (adults only). UVEX Glasses - sleep is everything! Honorable Mentions For Targeted Support - may use Grass Fed Intestines (w/ Tripe) for gut health... Thymus or Spleen for allergies or to boost immune system... Kidney for kidney and urinary support... Brain if the brain need a boost... Bovine Tracheal Cartilage to recover an injury or for intensive gut support... Thyroid in the winter when little to no carbs are available... Adrenal if adrenal support is required... you get the picture. 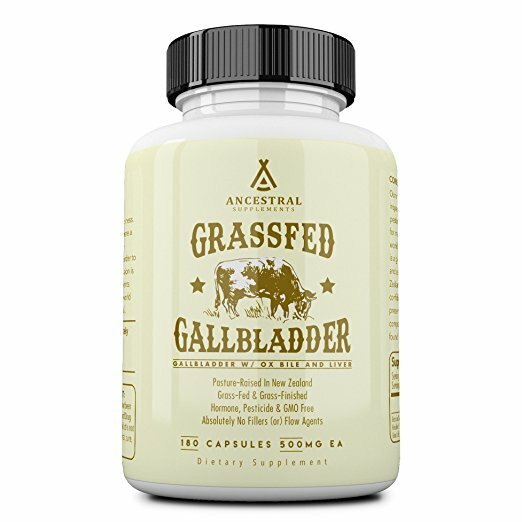 On the other hand, if you're looking for targeted organ support, you will likely be interested in our GRASSFED GALLBLADDER (W/ OX BILE & LIVER) to support an ailing biliary tract... GRASS FED BEEF HEART to support heart health (or) our GRASS FED THYROID to support a struggling thyroid (or) our GRASS FED THYMUS to support thymus function and immune health... you get the picture. * We have a nose-to-tail product line that can be found on our "Products" page. If you can't find what you're looking for (or) you're not sure what you're looking for, send us an email and we'll do everything we can to help. Not all organs and glands are the same. Look for the highest quality bovine gallbladder, ox bile and liver... It should come from small family farms... pasture-raised, grass-fed and grass-finished animals that are hormone, pesticide and GMO free. If considering a supplement, look for one that is ultra pure (without binders, fillers (or) flow agents) and look for the freeze dried variety as these have been shown to optimally preserve nutritional factors, growth factors and co-factors. Frazier, I. (2006). Great plains. London: Granta. Montgomery, S. (2009). Search for the golden moon bear: science and adventure in Southeast Asia. White River Junction, VT: Chelsea Green Pub.